Wipaq provides all the needed ID card printing works to be completed within half the time as it is super fast especially the Timepaq Classic which has come very handy in timekeeping in an industry setting. 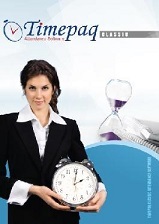 The software is highly utilitarian and gives you the flexibility to record the time habits of all the employees. Our time attendance software offers a vast range of functions such as scheduling the activities, in and out timing records, smart card reading features all of which have become very essential in a workplace due to the changing work culture and a global view of timekeeping.